For Sweet Life (also known as Sweet Aerobics), fun does not mean leisure, fun starts early and it starts explosively. 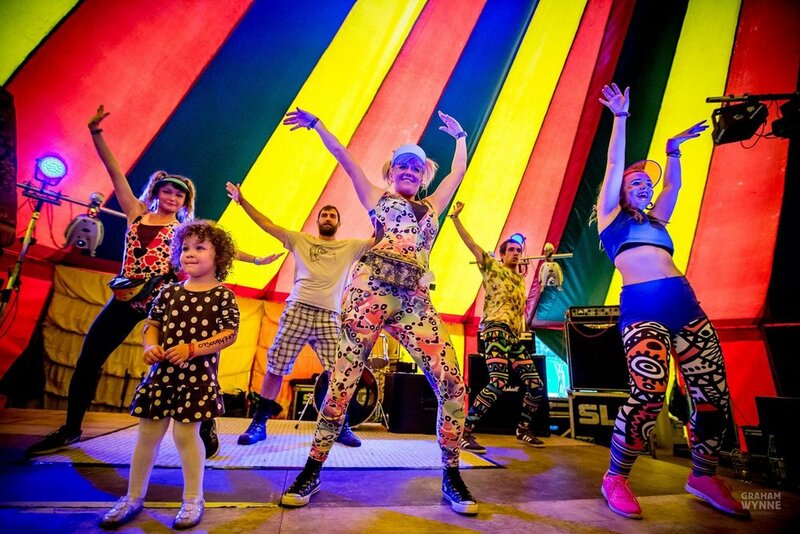 The spandexed collective bringing back the golden days of 80s aerobics will be running daily Sweet Wake-Up Calls and taking over the Thunderdome arena at this year’s Eden Festival. Gallivanting around to interrupt hangovers with morning stretching and afternoon games, Sweet Life form a powerful bond between dance, exercise and pure silliness. The Sweet Wake Up Calls characterise what the movement has been dedicated to in the last three years. With events spanning from inner city Glasgow to the festival fields of the wider UK, the group creates friendly and high-energy atmospheres that break down the psychological boundaries of exercising. Leony Mayhew, creative head of the movement, calculates that since its 2014 launch Sweet Life has given over a thousand people dance classes on a pay-what-you-feel or free basis. Waking the scene up from what can sometimes seem like an overly serious dance and exercise culture. Their energy is infectious. Marie Williamson, Sweet Motivator in chief, recalls a festival last summer where a family approached her saying that they were woken at 6am by their bright-eyed son who had lead a yoga class based on a Sweet Life workshop from the day before. Eden has proven to be the perfect canvas for the Sweet Life project of creating fun and family friendly spaces. “These spaces make the atmosphere different to commercial festivals, they open up the possibility for anyone to escape and be silly. There’s nothing better than that.” Leony affirms. 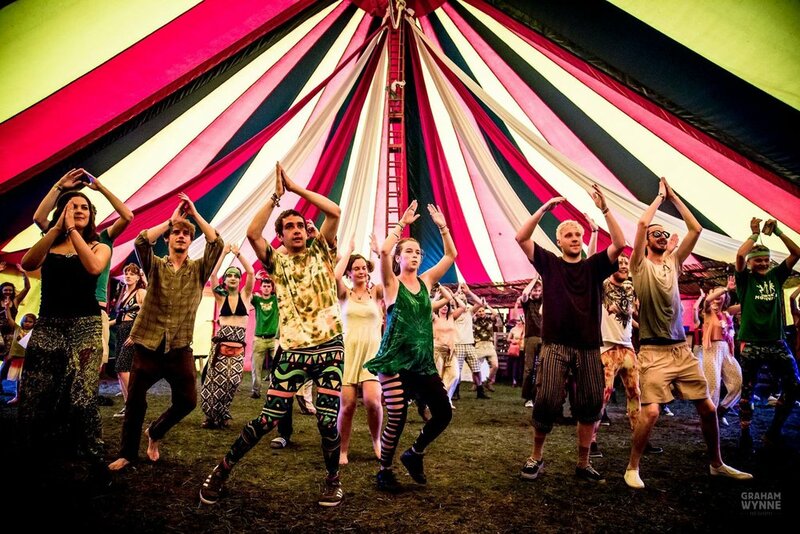 From passing from tent to tent giving bespoke yoga sessions to sharing the main Devorgilla stage with Mr Motivator, Sweet Life has played an array of roles at Eden. Their efforts and previous collaborations have been rewarded with donship of the Thunderdome Arena this year. Inside this theatre of haystacks, the energetic antics will consist of human slug racing and conveyor belts, booty shaking competitions, soul trains, silly walks and mad prizes whenever possible. The scenes are likely to recreate a real life Mario Party, but with even crazier characters. Helping the Sweet Life motivators bring the background of the festival to the forefront of the mind, fancily dressed DJs and MCs will be supplying bouncing beats and crass jokes. Already confirmed, Frogbeat’s own shapeshifting Sombadi will be playing out funk, soul and rare grooves, whilst Scotch Bonnet collaborator Cream T and funkmaster Wynned & Grind will be following suit. On top of their tunes, more Sweet Motivators will be keeping giggling levels high with some classical pantomime comparing. Sweet Life now has the scene set for a full weekend of silly, safe, family-orientated fun. Keep a look out for them, they will not be difficult to spot. From Friday to Sunday from 12-5pm they will be at the Thunderdome. Most of all, they will be the ones waking you up in the morning and getting you going! The Sweet Life team have informed us that they are looking for more volunteers. If you are interested, message them on facebook.